Supposing you've actually managed to make your way through the morass and have found yourself a few good blogs that aren't just charlatans trying to pawn off guides to buying gold or some questionable vegetable seeds, there's also the unfortunate fact that information on the Internet tends to come out in staccato bursts, not as an encompassing whole. To coalesce all this information into a proper narrative requires time and effort of course, to go along with the fact that virtually no one wants to scroll through and actually read 100,000 - 200,000 words on an Internet page. So although books can't possibly be as up to date as a blog, they can give the much needed "big-picture" account that tends to be anathema to the Internet. And that "big-picture" regarding global events of the early-21st century has fortunately now been assembled by blogger (Insurge Intelligence) and author Nafeez Mosaddeq Ahmed – Failing States, Collapsing Systems: Biophysical Triggers of Political Violence. In his contribution towards rectifying our knowledge deficit, Ahmed draws early attention to the fact that oil's global EROEI levels have been declining since the 1960s. Coupled with a global oil production rate whose continued increase since the 1960s has been going on at a slower and slower rate, and what we're left with is the startling correlating fact that the global growth rate of GDP has been slowly dropping since the 1960s as well [p. 27]. Energy makes the world go round. Added to this is the fact that while abundant fossil fuel supplies have allowed for the expansion of the monetary and financial system, decreasing EROEI levels have now implied an increasing need to rely on financialization (lest our Ponzionomic system implode in on itself). Or as Ahmed puts it, "the shift from the expansion of money, to the expansion of credit (debt-money) [p. 37]". This was most recently seen by the quantitative easing (AKA "printing money", AKA credit creation) to bail out insolvent banks after the rash of predatory lending-induced consumer defaults. In the meantime, Ahmed points out that various forms of state-level violence have been intensifying since the 1970s and then accelerated in the late 1990s, the former corresponding with the period when oil's global EROEI level peaked, the latter with the year that the global EROEI level for all fossil fuels (not just oil) reached its overall peak (1999 to be exact), both of which have been steadily declining since. What is probably Ahmed's most cogent example of this emerging "crisis of civilization" is the ongoing problems currently besieging Syria. The conventional argument given as explanation for Syria's plight is that of repression by its president, Bashar Al-Assad, an argument that is a grossly oversimplified explanation, in line with explaining away the "Arab Spring" as being due to a "deficit of democracy". As Ahmed points out, this misconception has resulted in "international policy [that] has focused on viewing the conflict through the lens of geopolitical interests and regional security [p. 49]". Fortunately, there are however those who recognize the role that climate change has played with Syria's misfortunes, others who recognize peak oil's role, and yet others who factor in the recent food price spikes. But as Ahmed sees it, all of these fail to recognize the systemic interconnections between these factors and so don't offer a systemic understanding. 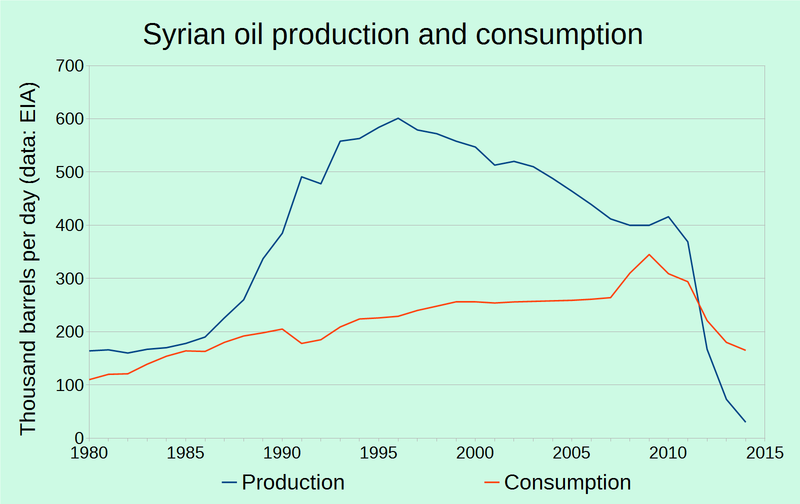 For starters, Syrian oil production peaked in 1996, dipped by almost half by 2010, and then plummeted again by even more than half upon the outbreak of war. 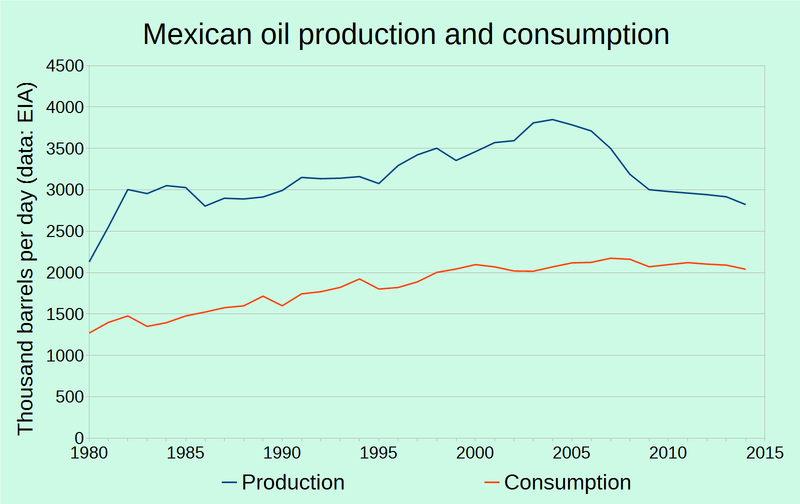 With a dwindling influx of currency due to shrinking exports of crude, the government was forced to slash fuel subsidies in May of 2008, tripling petrol prices overnight and significantly driving up the price of food (a serious problem when food makes up an overwhelming part of your budget, and when what you eat is virtually nothing but staples). Ongoing drought conditions have only exacerbated poor harvests in what used to be a country self-sufficient in wheat, and so coupled with spiking food prices and Assad's inability to maintain subsidies due to dwindling influxes of foreign currency, the situation has only gotten worse, and then worse, and then worse. 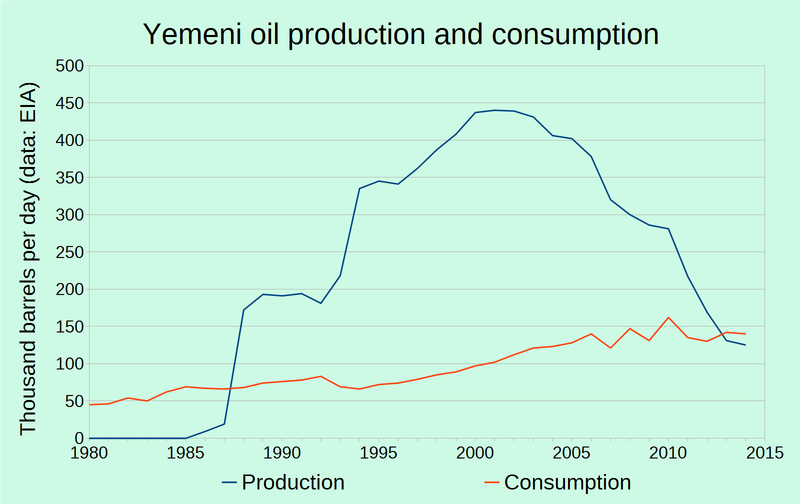 Using the situations in Syria and Yemen as base-points, Ahmed surmises that it takes about 15 years from when a country hits its peak in oil production before additional systemic pressures – such as drought, overpopulation, climate-induced water and food scarcity – contribute to outbreaks of systemic state failure. How's that bode for the rest of us? To answer that, one must take another look at the situation in the Middle East, if not at its largest producer, Saudi Arabia. While Saudi Arabia's primary source of revenue is of course oil, according to Ahmed Saudi Arabia is expected to reach its peak of oil production by no later than 2028. 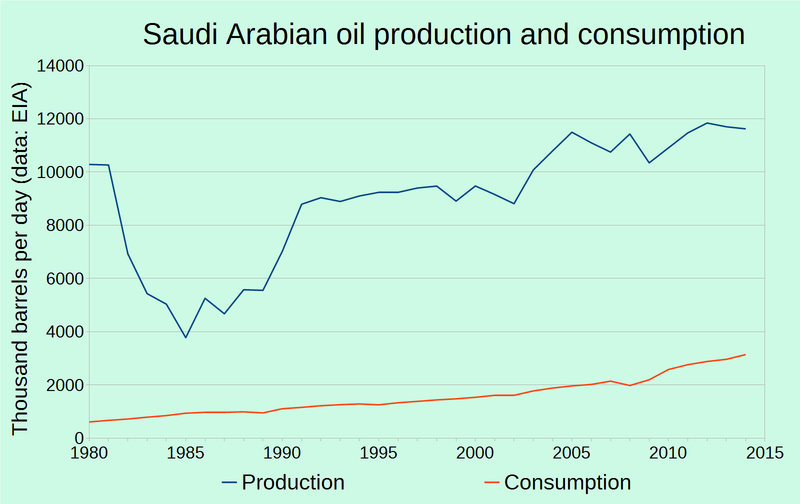 But that isn't its only problem, because due to a significantly rising population which is adding to what are already rising internal consumption levels, Saudi Arabia has actually been exporting 1.4% less oil year upon year. While implying an earlier kind of peak, this of course doesn't bode well for those expecting Saudi Arabia to be their sweet-crude-daddy (which I'll get to in a moment), and will eventually impose upon Saudi Arabia a world of its own problems. While Saudi Arabia went on a crash course several decades ago to increase its wheat production in order that food couldn't be used as a weapon against it in the same way that it withheld oil from the West (for a while Saudi Arabia, a desert country, was actually one of the world's largest exporters of wheat), its depleting aquifers have been recently putting an end to production that was also using up 18 percent of its oil revenue. While the state-sponsored Saudi Arabian wheat production is now kaput, Ahmed points out that 80% of Saudi Arabia's food is purchased through subsidies. Along with that, he states that 70% of Saudi Arabia's domestic water supplies are procured through desalination, an extremely energy-intensive process that estimates state burns through about half of its domestic oil consumption. For the time being, and unlike Syria and Yemen, Saudi Arabia has been able to stave off its own "Arab Spring" thanks to bounteous subsidies for housing, food, water, oil, and other consumer items. But as Saudi Arabia's oil exports decline to zero in the next 15 years, and as the then-subsequent dwindling production for internal usage means less air conditioning, less water, less happy motoring (that is, supposing your gender is even allowed to drive in the first place), less everything, life in the desert is once again going to become like life in the desert. As the saying goes, and to put it lightly, "My father rode a camel. I drive a motor car. My son flies a jet plane. His son will ride a camel." That's not to say though that Saudi Arabia is only Saudi Arabia's problem. As Ahmed points out, Saudi Arabia's and the Middle East's exports of oil will be significantly decreasing right when China and India will be expecting significant inputs in order to power their booming economies (not to mention their need for increasing imports of food). 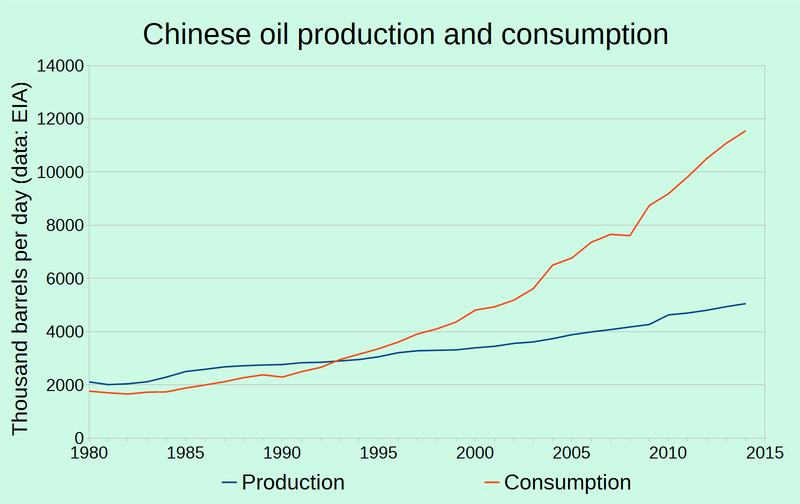 Since China's supplies of coal and conventional oil have in all likelihood just recently peaked (as stated by Crude Oil Peak, Peak Oil Barrel, and others) and its supplies of unconventional oil are expected to peak in another five years (as Ahmed relays), then like India China is in all likelihood going to be experiencing "outbreaks of domestic disorder [that] will become more organized, and will eventually undermine state territorial integrity before 2030 [p. 75]", all of which will render a shift of power to the East all but fantasy. As crisis convergence unravels the global food system across the Middle East, Africa and Asia, geopolitical pressures and northern Europe's relative immunity from the immediate impacts will make the region a prime target for regional and international migration [p. 80]. The cases examined here thus point to a global process of civilizational transition. As a complex adaptive system, human civilization in the twenty-first century finds itself at the early stages of a systemic phase-shift which is already manifesting in local sub-system failures in every major region of the periphery of the global system. As these sub-system failures driven by local ESD-HSD [Earth System Disruption - Human System Disruption] amplifying feedbacks accelerate and converge in turn, they will coalesce and transmit ever more powerfully to the core of the global system. As this occurs and re-occurs, it will reach a system-wide threshold effect resulting in eventual maladaptive global system failure; or it will compel an adaptive response in the form of fundamental systemic transformation [p. 88]. Such a vision may, in the current context, appear impossibly utopian. By 2030, and even more so by 2050 – as the manifestations of global capitalism's self-catabolic trajectory become more obvious – it will appear increasingly realistic [p. 91]. Although the book's first two introductory chapters may be a bit too theory-laden for some, the remainder of the book – a very accessible 94 pages in total – without a doubt gives the best "big-picture" explanation of why world events are currently playing out the way they are. If you're new to the notions of peak oil / EROEI / collapse of industrial civilization, and/or would like to try and enlighten a friend that might be receptive to these issues, I'd say that you can't go wrong by picking up a copy (a hardcopy!) of Failing States, Collapsing Systems.